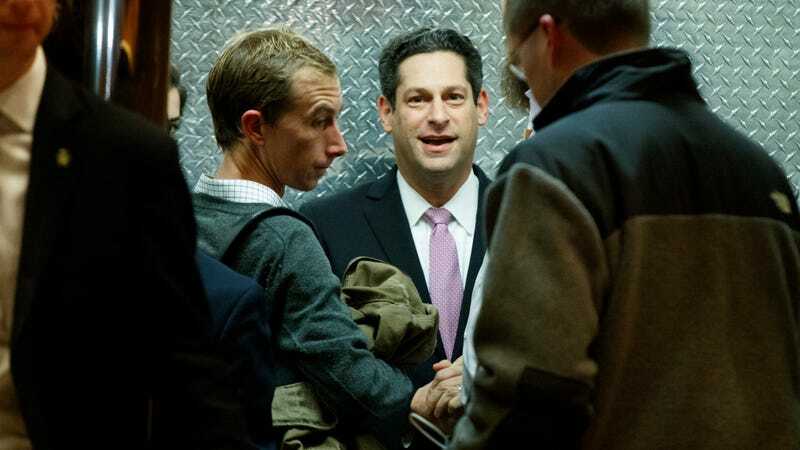 Joel Kaplan entering an elevator at Manhattan’s Trump Tower for a meeting with Donald Trump in late 2016. Some employees at Facebook have been furious that one of their top lobbyists, vice president for global public policy and former George W. Bush administration official Joel Kaplan, publicly supported Supreme Court Justice Brett Kavanaugh during his confirmation hearings even as the latter faced multiple allegations of sexual assault. This probably won’t help: Over the weekend, Kaplan hosted a little shindig to congratulate the guy for landing on the court. — FACEBOOK’S JOEL KAPLAN and his wife LAURA COX KAPLAN hosted a Kavanaugh celebration at their house last night for people who had worked on his nomination. Brett and Ashley Kavanaugh stopped by the gathering of about 25 people that was organized by Laura, Ginger Loper and several other Kavanaugh female supporters. No word on whether Kavanaugh knocked back a beer or four while there. The legitimate grievances brought by Facebook staff included complaints on internal message boards that Kaplan’s attendance at the hearings disrespected survivors of sexual violence. Executives including CEO Mark Zuckerberg and chief operating officer Sheryl Sandberg responded during a town hall-style meeting last week that while they disagreed with Kaplan’s actions, the VP said his support was personal in nature and that the company does not place any prohibitions on actions outside of work. ... “I appreciate your desire to avoid taking sides, but please don’t insult our intelligence by declaring that this act did not violate our policies, or that it was only an honest lapse in judgement,” one engineer wrote in a post addressed to the chief executive. Facebook characterized Kaplan’s support at the hearings as a mistake, writing in a statement to media outlets that “Sexual assault is an issue society has turned a blind eye to for far too long—compounding every victim’s pain. Our leadership team recognizes that they’ve made mistakes handling the events of the last week and we’re grateful for all the feedback from our employees.” It would appear that feedback was indeed filed, though somewhere short of Kaplan’s event planner.